Whenever she designs a bowl, a dish or even a jug, Carrol includes statuesque figures that intertwine and become part of it, celebrating the beauty of the human form as she does so. Her creation is then cast in polished aluminium for a timeless appeal, and finished by hand for individual character. Ideal as a small serving dish, the Over Load! 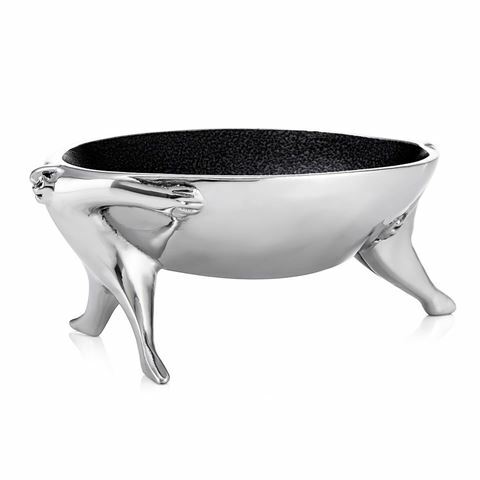 Bowl is sure to become a conversation piece, as two small statues seem to struggle to hold up the weight of the bowl on their shoulders. Dimensions: 18 x 6.5 x 11.5cm.